I have, what some might call, an insatiable lust to create a lighter bike. This pursuit, nay this passion, has driven me to replace just about all the components on my bike a few times over. Dura Ace 7800? Been there, done that. 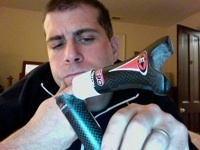 SRAM Force, uh huh. SRAM Red, loving it but gotta ditch that heavy crank. I have been known to opt for less durable parts if they’re going to be lighter weight. One area where I will not compromise though is in saddle selection–if my arse isn’t comfortable, I’m not going for a ride. And if I’m not going for a ride, why am I working so hard to make my bike light? I’ve tried a few all-carbon saddles, I’ve tried some minimally-padded saddles, and again and again my posterior keeps bringing me back to the wonderful saddles made by Fizik. (For the record, they like to spell it Fi’zi:k, but that’s pretentious and weird, and really hard to type.) I’ve had a Fizik Aliante or Arione saddle on every just about bike I’ve had for the last few years and so I jumped at the chance to ride the new Fizik Antares. At 145 grams (mine came in at 143, without the little plastic hoo-gaw that fits into the accessory slot) the saddle is in the lightweight class, that’s four grams lighter than their carbon-only Arione K1, and it’s about 20 grams lighter than their carbon-braided Arione. 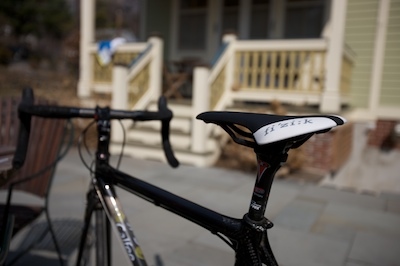 Fizik claims 3.7 times the padding of other saddles in the class, and while I didn’t feel like ripping apart saddles and testing foam density, my rump was recently subjected to a competitor’s ultra-light-weight-yet-padded saddle, which now belongs to someone else. The Antares though provides enough surface area and flex to actually support the sit-bones, the part of the body that actually rests on the surface of the saddle, and provides cushioning where it’s needed, but not where it’s not. If you head to the Fizik site it’s hard to miss the Antares, a big splash page awaits you touting the saddle as being the “Third Dimension,” which seems somehow to relate to the fact that it’s the third saddle in Fizik’s pro lineup. Not quite as important as the actual third dimension, but they seem pretty proud of it, and for good reason. The Antares is around $230, which makes it on the high end for saddles in general but reasonable for light-weight platforms and is well worth it in terms of comfort and weight savings. If you’re looking for a light-weight saddle that won’t hurt the junk in your trunk, the Antares is a good choice.